Dortmund - With the confirmation of Pierre-Emerick Aubameyang's transfer from Ligue 1 side AS Saint Etienne to Borussia Dortmund, the Yellow-Blacks sent out a stark warning to the rest of Europe that there is indeed life after Mario Götze. The now FC Bayern Munich employee was seen by many as irreplaceable, but in Aubameyang, Dortmund could hardly have asked for a more prolific and versatile alternative. At 6' 2", the Gabon international certainly has a presence about him and since leaving the disappointment of his AC Milan days behind him - he was deemed surplus to requirements in 2008 - he has managed to forge quite a reputation for himself both domestically and on the international circuit. Aubameyang did his country proud at the 2012 African Cup of Nations, scoring in all three group games before missing a penalty in the quarter-final shoot-out defeat to Mali. A little over a year later, he was voted the French top flight's Best African Player for the 2012/13 campaign, after notching 19 goals and nine assists in 36 outings. To put that into perspective, only former AC Milan team-mate and, ironically enough, Aubameyang's personal favourite, Zlatan Ibrahimovic, found the net on more occasions (30). "He is top class, an amazing striker," the 24-year-old said of his Swedish muse. "Despite being very tall, he is really great on the ball. If I can do as much as him, that’d be good." Aubameyang did not do quite enough to match the goal-scoring exploits of the aforementioned Paris Saint-Germain striker, but capturing the attentions of Jürgen Klopp is hardly a bad consolation prize. The BVB coach knows all about working with modern day forwards - and that's exactly the type of player he's got in Aubameyang. Just as adept in the lone striker role as he is strutting his stuff on the flanks, the Gabonese hotshot not only scores goals, but is also super-quick. 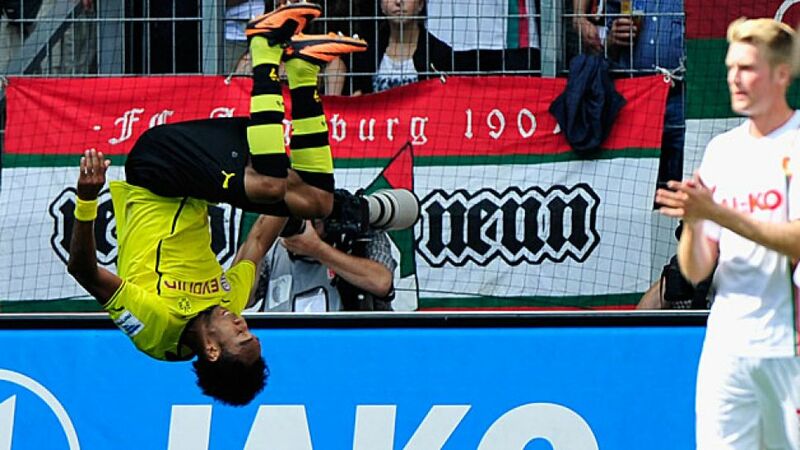 Aubameyang is able to sprint 30 metres in an amazing 3.8 seconds, a marginal 0.02 seconds slower than Usain Bolt ran the same distance in his 100-metres world record run. All Klopp has to do now is decide how best to deploy his new recruit.